OPEN MAY 1st to OCTOBER 31th, Monday to Sunday from 9h to 18h..... WELCOME !!!! 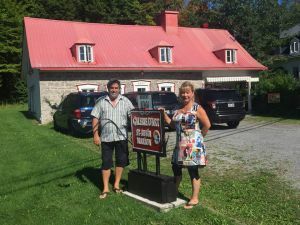 After having traveled through Quebec for over 25 years with their brushes, the professional artists Louise Marion and Yvon St-Aubin laid their penatoes in the village of Château-Richer, the birthplace of the Francophonie in America and opened their own Art Gallery. The realization of a dream of life has taken shape for these two painters with colorful paintings and they are very proud of it. Since 1 August 2016, the new Galerie d'Art ST-AUBIN MARION is open to the public at 8361 Avenue Royale in a magnificent ancestral house of the early 1800s, erected on a ground granted to Toussaint Toupin in 1650. A large parking allows To accommodate cars and a bike area has been fitted out for cyclists. Louise Marion has exhibited at the Louvre Museum in Paris and her production of urban scenes and landscapes of Provence and Tuscany are a great success with the public. Yvon St-Aubin is a painter landscape painter. The rays of light in his paintings constitute his artistic signature. Remember that Canada Post issued a stamp in 2010 with one of its paintings. The Art Gallery offers original paintings of various formats of the two artists as well as some products derived from their productions. The opening hours are from 9 am to 6 pm and this 7 days a week, between 1 May and 31 October of each year. Welcome to the colors of these two painters!